Drama. There’s lots of buzz in the press today about the renewed and future prospects of the Internet pioneer and giant YHOO Yahoo! Incorporated which is under new management. Large stakes have recently been bought or increased by the self-styled hedge funds Tiger Global Management (who bought an estimated $400 million and 25 million shares in the last several months) and Greenlight Capital Management (estimated $90 million or 5 million shares) (Reuters, November 19, 2012, Yahoo shares reach 18-month high as investors warm to new CEO). Tiger Global has also traded a significant amount of its cash ($200 million) for an additional 10% stake in GRPN Groupon Incorporated which is currently trading at near to its lowest price ever ($3 or less) since the IPO at $20 per share in November of last year. Please see our Post, Initial Purchase Offers (IPOs), November 2012. Clearly, if one measures the capital available for investment in the hundreds of millions and several billions of mostly other people’s money, then small “moves” or “small” investments just don’t count. For example, a 1% interest in Yahoo! retails for $200 million today and these two folks have taken a 2 1/2% stake or “stab” between them. It can’t be because Yahoo’s 40 percent stake in China’s Alibaba Group is still Yahoo’s “most valuable asset and possibly worth Yahoo’s entire current market value ($20 billion at the time)” (Greenlight Capital quoted in Reuters, May 2, 2011, a year ago). That’s already gone because Yahoo’s interest was finally sold in September for about $8 billion and netted Yahoo! $4.5 billion after taxes and fees. 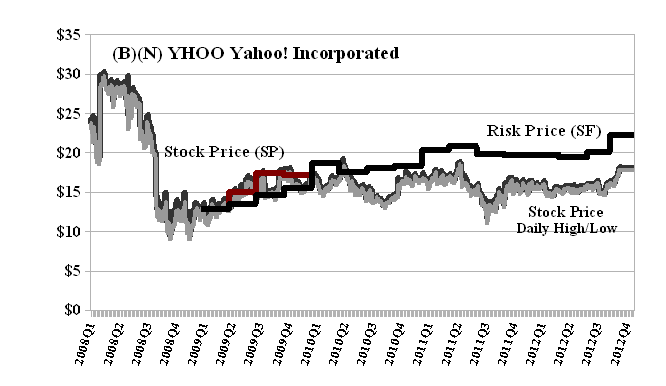 Most of that ($3.7 billion) is expected to be returned to shareholders at the rate of about $3 per share, Yahoo’s first dividend payment ever, although the dividend payment is still under review by the new management and the company might keep the money to fund future growth, they say. But, alas, reputations aside, Wall Street consumers continue to fret that Yahoo! has not yet provided any “hard” evidence that it has “turned the corner” despite the “green light”, so to speak, and it continues to trade in the volatility zone (N) of investor anxiety and uncertainty (please see Exhibit 1 below) which makes our non-investment decision much easier but less “penetrating” in terms of dramatic stabs and stakes in a rather “hard” market. Yahoo! Incorporated is a global Internet brand and digital media company. It is engaged in creating content, communications, and community platform that delivers consumer experiences and advertising solutions.